Wisp O' Mist was Misty's second foal and first daughter. She was a solid chestnut without any markings. Instead of running another naming contest, Marguerite Henry plucked the name Wisp O' Mist from one of the left over entries. However, the Beebes more often called her Little Wisp. Wisp is the "middle child" and is often overlooked. Unlike her brother and sister, Wisp never had a Breyer model made in her likeness. No one talked about her pretty markings because she had none. Yet Misty prized Wisp and the two were able to spend quality, quiet time together. The story of Little Wisp's birth and pictures of her were published in The Pictorial Life Story of Misty by Marguerite Henry. Little Wisp lived a short life on Beebe Ranch. 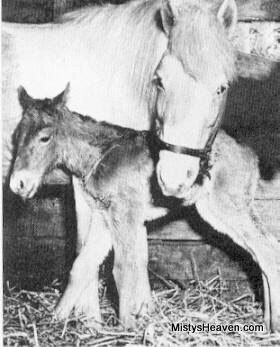 She only had one foal, the talented palomino gelding Cloudy sired by Lightning. Little Wisp tragically died much too early in 1964 after she and her full brother, Phantom Wings broke into a cow field and got sick off the feed.